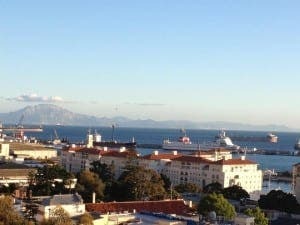 A BRAND new independent senior school in Gibraltar is set to open in September 2016. The exciting project, part of Prior Park Educational Trust (PPET) which already has three top independent Catholic schools in the UK, plans to expand the educational landscape of the Rock. 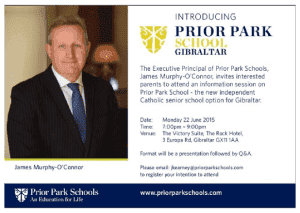 And the executive principle of Prior Park Schools, James Murphy-O’Connor, is coming to Gibraltar in June (see invitation below) to answer any questions. Murphy-O’Connor is inviting interested parents to attend an information session on June 22 from 7-9pm at the The Victory Suite of The Rock Hotel. When the opportunity to open a school in the old Sacred Heart campus was presented, Prior Park submitted an application along with a number of other high profile UK school groups. 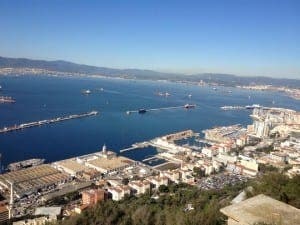 The Gibraltar Secondary Schools’ Parents’ Group accepted Prior Park’s application based on the values and ethos demonstrated by the existing schools. Recruitment of the head, bursar and first refurbishment will begin in September 2015 with the first intake of students in September 2016. 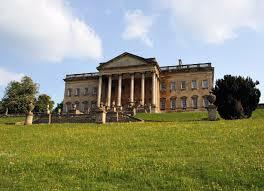 For more information visit www.priorparkcollege.com and please email [email protected] if you would like to attend.